Why can’t I live in this series? I mean really, why hasn’t someone invented something to take us inside books yet? WHY? It would just make us all better people. 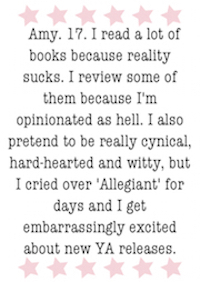 And honestly, boys, girls, weather, love, food and life in books is just… Better. But if I could choose one series to live in, it would most definitely be this one. I love Cassandra Clare’s world. It’s amazing how she came up with all of this, and then managed to make it realistic enough that I still have to remind myself that no, I do not ACTUALLY live in London in the 1900s, and I am NOT a shadow hunter, and the neighbors are NOT actually Mortmain’s Infernal Devices intent on my destruction. I hope. That would be quite awkward for me, seeing as I am not a shadow hunter, nor do I have the slightest inkling as to how to protect myself against a bunch of robots programmed to destroy me, and possibly containing demon spirits in them. I don’t know how she does it, but Cassandra Clare made me love both Will and Jem at the same time. To be perfectly honest, I was seriously pissed off when Jem proposed to Tessa in Clockwork Prince, just as Will found out that his curse wasn’t real. I wanted to kill Jem, because Will and Tessa are just MEANT to be together, and Tessa wasn’t supposed to love Jem, because she and Will were PERFECT for each other! But in Clockwork Princess, I forgave her for committing the worst possible crime an author could do (other than murdering the main character, but a love triangle between best friends is almost as bad), because Jem was so sweet and, as it turned out, Tessa did actually love him. And everybody was happy at the end, because both Will and Jem got to spend the rest their lives with Tessa (at different times, thank the Angel), so I was happy because it was a happy ending overall. After a long wait for the release of this book, with loads of crying in desperation at how far away the release date was with my friends (“How much longer? !” “Thirty seven days!” *cue epic fangirling because it’s one day less than yesterday*) and then the frustration at the teasers (“…the torn gold fabric of my wedding dress…” “What the hell is THAT supposed to mean??! !”) and the excitement when it finally arrived (we were shouted at by the rest of the grade, and several teachers, because we screamed so loudly), it was totally worth it. And I couldn’t even savour it, because it was just absolutely amazing, and to take more than a minute to read a page was just wasting time.